Welcome to the Richland-West Neighborhood Association website! Keep in touch with neighbors, join us at upcoming events, and learn about the history of the Richland-West End Historic District we call home. Keep an eye on the calendar for upcoming events in our neighborhood. Stay informed with the most recent neighborhood newsletters for current happenings. If you'd like to begin receiving our newsletters electronically, sign up using the form on the newsletter page. The October newsletter will be distributed the weekend of 10/12/18. Keep an eye on your mailbox, or access the electronic version on the newsletter page. 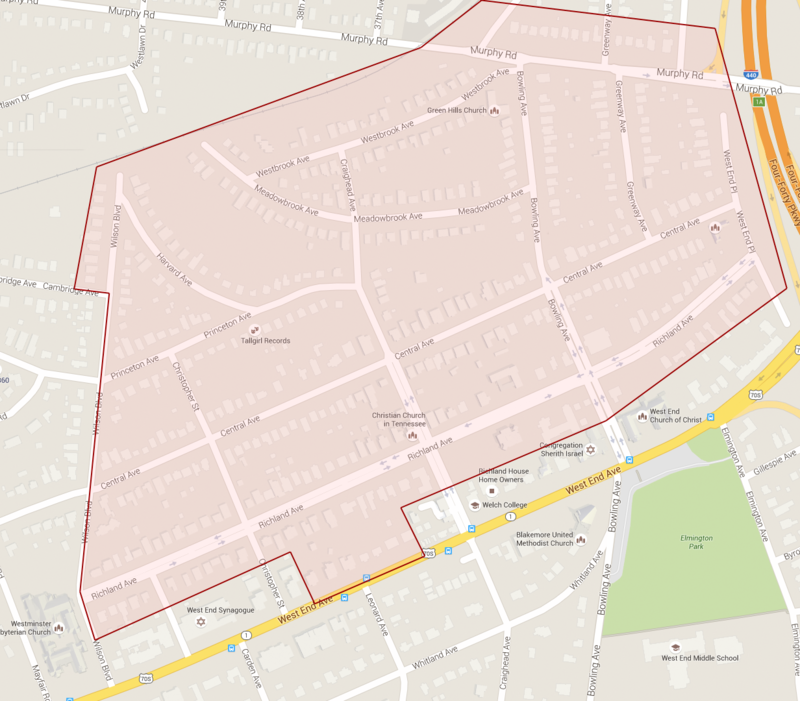 The Richland-West End Historic District is comprised of approximately 70 homes in a 12-block area, roughly bounded by Murphy Road and railroad tracks, West End Avenue, I-440, and Wilson Boulevard. Listed on the National Register of Historic Places in 1979, the neighborhood is known for classic homes with tree-lined streets, sidewalks, and front porches. The ambiance and historic character of the Richland-West End neighborhood are fiercely protected by a strong neighborhood association.